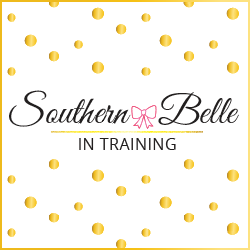 Today I am celebrating Southern Belle in Training's 4th blogiversary! Technically this day was actually yesterday, as my blogiversary falls on my birthday. But this year I felt that I had a lot of thoughts to write out on my birthday, so I decided to separate the day into two separate blog posts. (Be sure to check out yesterday's post if you haven't yet!) I usually share my favorite blog posts from the past 12 months and talk about the highlights of the year in blogging at the end of December of each year. But in honor of this blogiversary, I thought it would be fun to do a Q&A with questions from all of you! I've read similar Q&A's to this one on many of my favorite blogs throughout the past year. Here are all of the fun questions that y'all tweeted to me! A big thank-you again to City Lights Rooftop bar at Le Meridien hotel for generously allowing me to use the venue for this photoshoot! Shooting in this space was an absolute dream. With that said, I do also appreciate the mountains! While I don't think I'd like to live in the mountains, I do love to hike, and I enjoy day trips to mountains in both New England and the Carolinas. Where do you see yourself in 10 years? Wow- what a question!! Hopefully still living in the greatest city on earth- Charlotte! If I don't live in Charlotte, then I see myself living in another wonderful Southern locale, or possibly somewhere in the middle of the country. I don't see myself returning to the North anytime in the future. I hope to be a syndicated radio show host by this point in my life. Or perhaps my broadcasting career will take a different turn, and I might end up in TV. We'll see! I really hope that blogging is still a thing in 10 years, because my little corner of the internet means so very much to me, and at this point I can't really imagine my life without Southern Belle in Training! Favorite item in your closet? My senior prom dress (which I re-wore this year to my last sorority formal), or my vintage Chanel purse from my grandmother. Early bird or night owl? 100% diehard night owl. College didn't help this at all. However with my current work and broadcasting school schedule, I am really trying to break this habit and maybe not become an early bird, but at least be more productive in the mornings! What's the best/most important thing you've learned when it comes to blogging? The most important thing that I've learned in 4 years of blogging relates to the blogging community itself. This is a phrase that's used in a lot of creative communities, but I think that it applies to the blogging community very well also. "Community over competition." I have met some of the most incredible women through blogging, some of whom have become my nearest and dearest real life friends as well! Open yourself up to the possibility of community in this world, and don't become stuck in compare your journey to someone else's. Blogging is such a unique platform and industry, and everyone's blog and social media grows at different rates, no matter how much effort you put into it. Being happy for your friends' successes and encouraging them is always the way to go! If you have a blog- don't just use it for your own growth, use it for the networking and social aspects too, and get involved in the blogging community! Favorite milkshake flavor? Haha I LOVE this question! I like to consider myself a self-proclaimed milkshake connoisseur. But when it comes down to it, my all-time favorite milkshakes are the simple ones. In my opinion, nothing beats a delicious chocolate malt shake! It's timeless, and very hard to mess up. I'm planning to write a blog post this fall or winter where I rank my favorite spots to get a milkshake in Charlotte (both chain restaurants and local hotspots)! What advice would you give to a friend who wanted to start a blog? I was so excited when this question was asked because my high school best friend is actually considering starting a crafting and lifestyle blog currently (shout-out to you Jules!). Probably the biggest piece of advice that I would give to anyone wanting to start a blog is to be aware of the time commitment involved with blogging! Obviously if you are only writing as a hobby and not to monetize (like I did for the first year of having this blog), then you don't technically have to post on any sort of a schedule. But if you are trying to gain followers and work towards a point when you can be accepted to affiliate networks or take on sponsored posts, then new and consistent content is so important! What is your favorite Britney Spears song? Gold star award to my girl Amy from Pastel n Pink for the best question of all- haha!! Many of you know from my social media that I was in Vegas this past weekend to both celebrate my birthday and also fulfill my lifelong dream of seeing Britney Spears in concert. I'll be sharing more about the concert soon... but for now I will leave things at the fact that I've been a ginormous Britney fan since age 5, when my parents (made the mistake) let me see part of her nationally televised Hawaiian concert. One look at those dance moves and one list to those songs and I was hooked! It's honestly very hard for me to pick my favorite Britney song. Different songs of hers have been my favorite at varying points in my life, and I also have associations to some songs for different memories. If I had to pick an absolute, all-time ffaaavvvooorrriiittteeeeeee Britney song, I would have to go with Oops!... I Did It Again. The Oops! album was actually my first Britney album (I got that one before Baby One More Time...). And let's be real- nothing beats the famous red jumpsuit from the music video! I hope that all of you enjoyed this Q&A! I would love to do another one in the future if y'all enjoyed. And from the bottom of my heart - thank-you to every reader, social media follower, brand that I've worked with, and everyone in my personal life who has supported my blog over the last four years! This little space on the internet has become so dear to me, and I have big dreams for it in the coming years. I am planning to do my first ever reader-survey in December during my yearly review posts, to see what types of content y'all will be wanting in 2017 and future years to come! The skirt that I'm wearing in this blog post is from a local Charlotte shop (the same that the dress was from that I wore in yesterday's post), but this is a very similar skirt! My custom made Southern Belle in Training t-shirt was created by a friend of my photographer, Deeana! She is preparing to launch a shop soon, but for now you can check her on on Instagram @lastearns. Cheers to four years, and here's to many more! You look so pretty! I really loved reading this! Your skirt is the best thing ever i totally love it! You are an absolute doll in pink! Cheers to 4 more years! 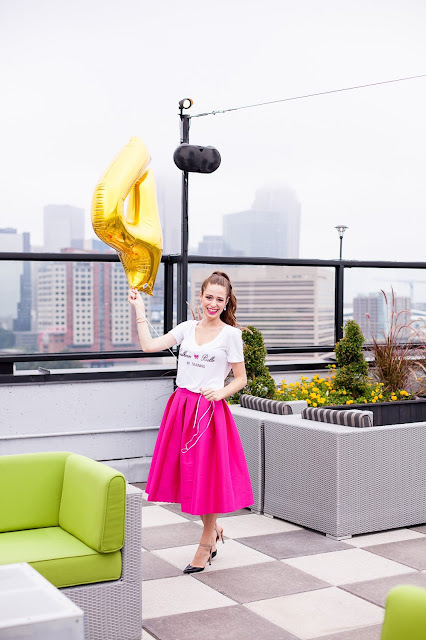 Happy blogiversary, Annaliese! These questions are so fun and I love your Southern Belle in Training tee! Aren't you just the cutest thing?! Congrats on 4 years of blogging! Congrats on 4 years thats amazing! I love this pink skirt! Happy 4th bloggiversary! That top is the cutest, and so fun when paired with that bright hot pink skirt. I loved reading this post! 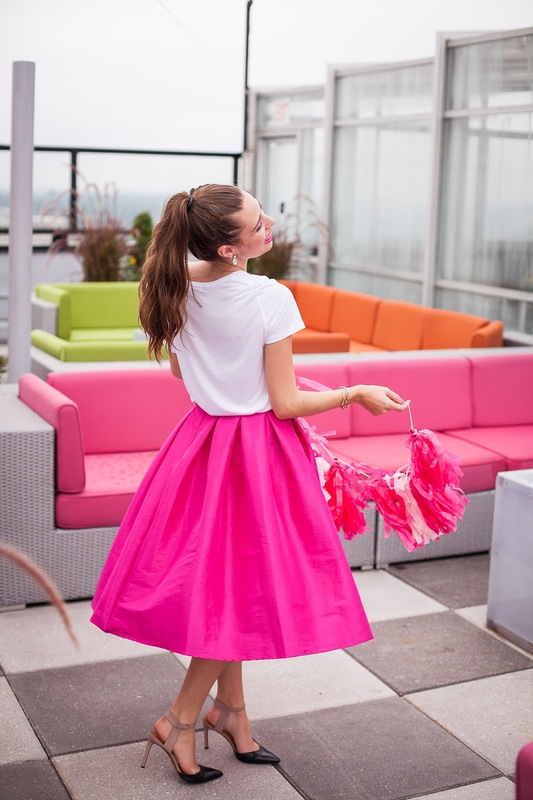 Love this Q&A and your pretty pink skirt! Happy Blogiversary! I am in LOVE with your shirt! I want one for my blog now :)! Aww congrats on four years girly! Your shoot is too cute!! What a fun way to celebrate your blogging success! And that place looks so fun and trendy! I LOVED the questionnaire idea! Happy Blogiversary! 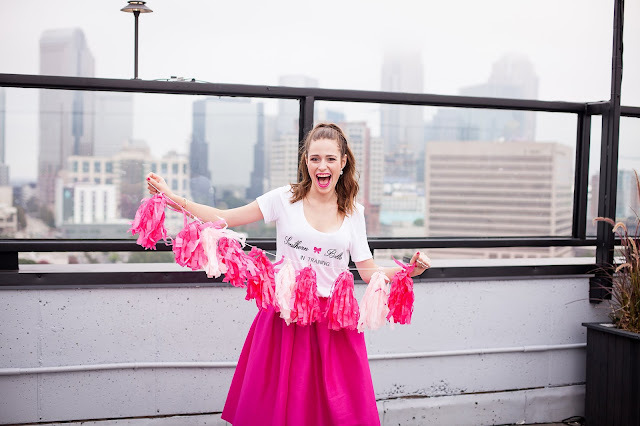 What a fun way to celebrate, love all of the pink! Wow happy 4 years! I love the skirt!! Congrats on four years!! This photoshoot is too too cute. I'm a night owl too! I think I'm slowly transitioning to an early bird though! Congrats on your blogiversary! This is such a cute shoot and I love your Q&A! Happy fourth blog anniversary! I am so happy to have gotten to meet you through blogging. Great pics, loved reading your answers! Fun and Affordable Business Casual Look. Eating For Cheap on the Las Vegas Strip. One Top Two Ways (Night Look): OTS Top for Fall. What I Wore for NYFW. Katie Gallagher Presentation at NYFW. One Top Two Ways (Day Look): OTS Top for Fall. Making Dark Colors Fun to Wear.